Climbing Cape May's Lighthouse ~ The History Girl! Just shy of 200 steps, climbing the lighthouse at Cape May Point is good exercise and a good history lesson. One of three tall seacoast lighthouses in New Jersey (the others being Absecon and Barnegat), the present lighthouse was built in 1859 and marks the entrance to the Delaware Bay. 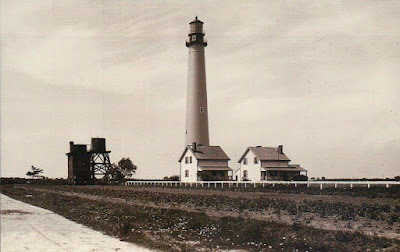 However, the current lighthouse was not the first one at Cape May Point. The first recorded lighthouse was built in 1823 and was 68 feet tall. Its walls measured six feet thick at the bottom and two and one-half feet at the top. The property for the first lighthouse was purchased by Congress from Mr. and Mrs. John Stites for $300 and measured one acre. The use of this lighthouse was discontinued May 1, 1847. In 1847, a second lighthouse was constructed about 400 yards northeast of the 1823 site. It was about 78 feet tall and located in front of the present lighthouse, on what is now the beach, depending on erosion and the tide. There are no known photos or illustrations of this lighthouse, but the base survived until at least the early 1940s and had a diameter of about 20-25 feet. In 1851, an inspection report found the lighthouse to be "rough and rudely built," leaking, unpainted, and rusty. Due to its poor construction, it was replaced by the current lighthouse just over ten years after it was built. The lighthouse, except for about eight feet of its base, was demolished in 1862. A roof was constructed over the remaining base of the lighthouse and it was used for storage and as a spring house. Eventually, the base fell victim to the sea. In 1857, the Army Corps of Engineers began construction on the third and present Cape May Lighthouse. By this time, the government had purchased four acres total for the lighthouse complex. The newest tower cost $40,000 to build. It included a first order Fresnel lens, which is now on display at the Museum of Cape May County about fifteen miles north in Cape May Court House. The lighthouse, much like Absecon and Barnegat, has two separate walls. The outer wall is cone-shaped and is three feet, ten inches thick at the bottom and one foot, six inches thick at the top. The interior brick wall is conical and eight and one half inches thick. The cast iron spiral staircase contains 199 steps from the bottom to the watch room. From the watch room to the lantern room, there are an additional eighteen steps, for a total of 217. The tower's overall height is 157 feet, 6 inches from the ground to the ventilator ball. Many believe that Civil War General George G. Meade oversaw the construction of the lighthouse, much like Barnegat and Absecon, but there is no evidence to support this. Meade commanded the 4th and 7th lighthouse districts from April 13, 1854 to May 31, 1856. He was replaced by Lt. William F. Raynolds. While Cape May was being constructed, Meade was in the Great Lakes region. The first order lens was lit by the new lighthouse's first keeper, William C. Gregory, on October 31, 1859. In 1860, two identical lighthouse keepers' dwellings were built in front of the lighthouse. Only one remains today, due to a fire in 1968. In 1893, the brick oil house with its pyramid roof was built. By 1902, one of the keeper's cottages was enlarged to provide more space for one head keeper and two assistants (and their families). That same year, an incandescent oil vapor lamp was installed. Finally in 1933, the light apparatus was electrified and three years later, in 1936, the lighthouse was automated. The last head lighthouse keeper was Harry Hall Palmer, who began his duty there October 1, 1924 at an annual salary of $960. He had previously served at Cape Henlopen Lighthouse in Delaware. The first order lens remained in the lighthouse until 1946 when a DCB-36 rotating light was installed. Cape May Lighthouse and two keeper's dwellings, circa 1914. Only the dwelling on the left stands today. In 1986, the Coast Guard leased the lighthouse to the Mid-Atlantic Center for the Arts and Humanities (MAC), the same group that was founded in 1970 to save and restore the historic Physick Estate in Cape May. That summer, the lighthouse base was opened to the public but visitors could not climb it until certain safety features were installed, such as an interior staircase railing (the outer railing was installed in 1865) and a cage around the watch room gallery. Restoration of the lighthouse began in 1987. The aim was to eventually bring the lighthouse to its circa 1907 appearance. In 1992, the Coast Guard transferred ownership of the lighthouse to the State of New Jersey, enabling the restoration of the lighthouse eligible for state historic preservation funding. Through this arrangement, the Coast Guard would still be responsible for the light. Since 1987, over $2 million has been spent to restore the lighthouse, oil house, and grounds. The lighthouse officially opened to the public May 28, 1988. In 1994, one of the largest restoration projects was undertaken - the tower was repainted and the lantern room and roof were restored. The lantern room restoration included removing the roof from the top of the lighthouse. In 2002, the Coast Guard installed a modern light known as a DCB-224. The lighthouse remains an active aid to navigation and flashes every fifteen seconds. It is visible twenty-four miles out to sea. In 2010, the Friends of the Cape May Lighthouse were formed to provide additional fundraising support and host programs.